This little seafood appetizer takes only a few minutes to prepare and will be the HIT of any party! This recipe is adapted from “A Sweet Pea Chef” and I found it on FB. There are sooooo many cool recipes on FB and I am always trying out new ones! Preheat your oven to 450 degrees and line a baking sheet with parchment paper. Take each shrimp and split it down the back but don’t cut all the way through. Place a jalapeño strip in the middle and wrap with half a strip of bacon. Secure with a toothpick and place on the parchment lined baking sheet. Place in the oven and bake for approximately 15 minutes…then turn each shrimp over and bake for another 15 minutes or until the bacon is browned. 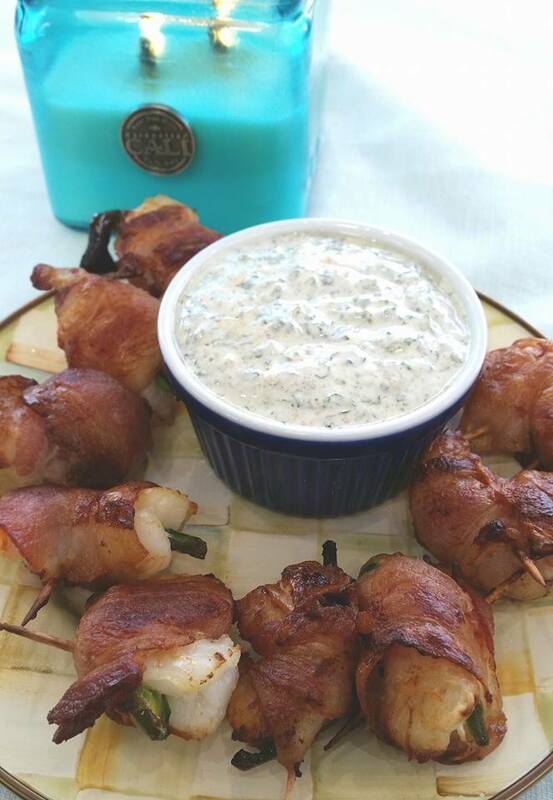 Remove and serve with the Cilantro Dip. In a small bowl, mix the yogurt, garlic, cilantro, lime juice, sea salt, cumin and black pepper until combined. Spoon into a pretty serving bowl and store in refrigerator until shrimp poppers are ready…then serve on a pretty dish with the shrimp. YUMMY! I just copied the recipe!!! Can’t wait to try it!!!! You always share such great recipes!!!! !